Greek Aiki-Jujutsu sensei Kostas Karipidis and his team break Three Guinness World Records and dedicates them in honor of the Japanese people and the Koyamada International Foundation (KIF). In a ceremony that took place in the Alexandroupoli gymnastic hall the success of the broken records was witnessed by Guinness World Record judge Tarika Vara and Japan’s Ambassador to Greece, the honorable Hiroshi Toda and his wife Ritsuko Toda, as well as with other officials from the Cultural Attaché of the Japanese Embassy. 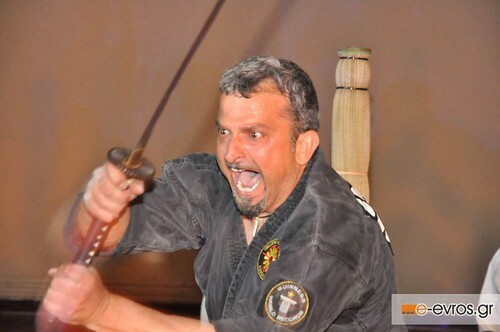 In a notice sent to the KIF by Sensei Karipidis, who is the head of the Aiki-Jujutsu traditional Japanese martial arts in Greece, he shared that his dojo broke the following records: His students Agisilaos Beseksidis and Miki Kiourtzidis broke the previous record of 30 martial arts throws by the same person in one minute with 34 throws; Sensei Karipidis broke the previous record of 30 katana sword cuts against stable objects (rolled tatami straw mats) with a whopping 68 cuts; and Sensi Karapidis broke his own record of 51 jujutsu throws in a minute against multiple attackers with 65 throws.